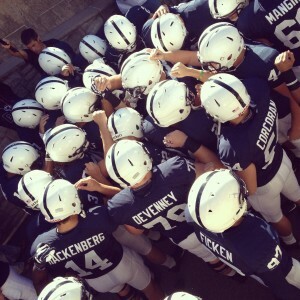 When I was anticipating my freshmen year at Penn State, all I could think about was Penn State football games. I had no idea what to expect or more importantly what to wear! The first game I ever went to was against UCF and I could not have been more excited. When I first walked up to Beaver Stadium, all I could see was a sea of blue and white. There were fans on every corner showing their Penn State pride and spirit. I will never forget my first steps into Beaver Stadium when I took my seat in the student section. The student section consists of more than 21,000 seats and every seat is filled on game day. Penn State’s enthusiastic student section is the nation’s second-largest full season student ticket section of any school, for any sport. I will never forget my first white-out game when Beaver Stadium was packed and full of Penn State pride. To see the passion from the student section alone is unbelievable. Every year the student section sells out and this year the freshmen tickets sold out in only 6 minutes. If you’re excited about Penn State home football games then get ready for away games. They are such an amazing experience and I recommend that every student should go to at least one away game before they graduate. I went to the Penn State vs. Syracuse game at MetLife Stadium last fall and I went to the Penn State vs. Rutgers game this past weekend. The camaraderie between Penn State fans is like no other. 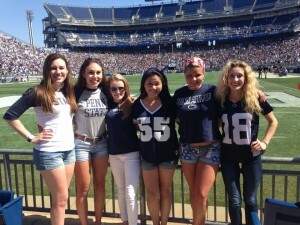 Nittany Lion fans from across the country come together to support one team. If you’re applying to Penn State, I hope that the love and dedication amongst Penn State football fans will win you over.